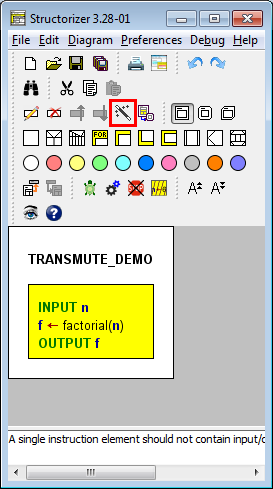 The function to transmute (convert) elements or sequences of elements into elements of a different type may facilitate the editing of Nassi-Shneiderman diagrams significantly. This is particularly helpful to make e.g. a subroutine call or an exit operational for the Executor or to merge or split several instructions in order to improve the diagram layout or to allow the setting of breakpoints between instructions that had formed a common Instruction element. Unstructured (simple) elements (Instructions, Calls, or Jumps), sequences of simple elements, counting FOR loops, CASE, and IF elements may be transmuted. Simple elements with a single line may change their type. Simple elements with several lines will be split, a sequence of simple elements will be merged. On merging simple elements, the type of element will only be preserved if all elements are of the same type, otherwise the result will be "downgraded" to a multi-line Instruction. 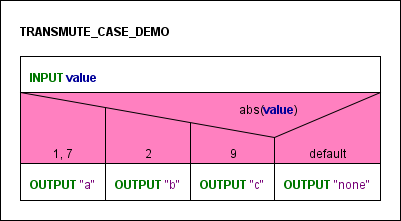 A FOR loop or a CASE element will be decomposed (see below). press the accelerator key combination <Ctrl><T>. These controls are only enabled if there is a suitable selection (see below). All transmutations are undoable and redoable. For some of the transmutations there is even a reverse transmutation, but not for all. 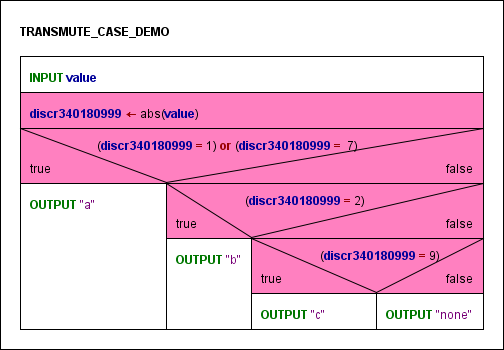 The transmutation of a FOR loop (of "counting" flavour) decomposes it into a WHILE loop with separate initialisation instruction and embedded incrementing/decrementing instruction. This operation is particularly sensible if an additional condition is needed to control the loop. And, of course, in order to demonstrate the equivalence of both constructs. 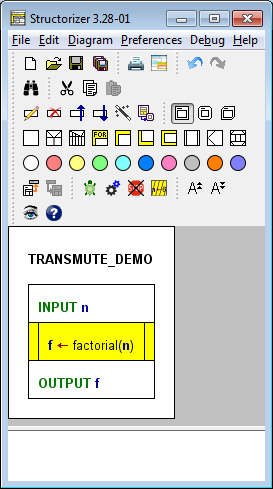 If the decomposed FOR loop was coloured then all substituting elements will inherit the same colour (see images below after separate transmutation of both inner FOR loops). 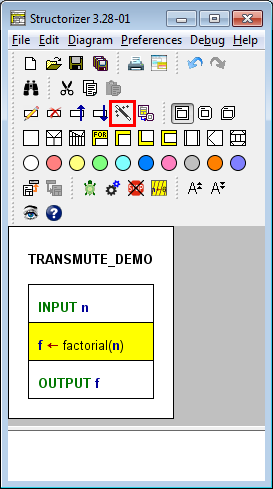 Note: There is no reverse transmutation for a FOR loop decomposition (it is only undoable during the current session)! And there is no transmutation for traversing FOR loops (aka FOR-IN loops) by now. Again, there is no reverse transmutation, i.e. you may not compose nested or chained IF elements to a CASE element automatically. 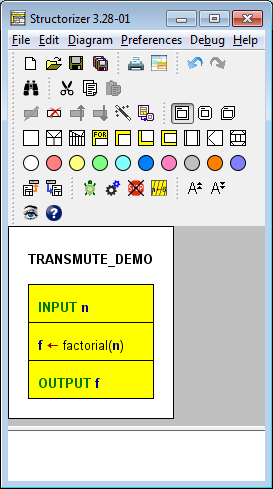 the resulting multi-line element is merged with further instructions. If an unambiguous re-distribution of the comment lines is impossible on splitting then the first of the separated instructions will obtain the entire comment while the following elements will end up with an emptied comment. The comment of a decomposed FOR loop is transferred to the replacing WHILE loop. The two created auxiliary Instruction elements will not inherit comments. The comment of a decomposed CASE element will be inherited by the first of the replacing elements, i.e. either by the discriminator assignment (if inserted) or by the outermost Alternative.